Try different hairstyles and haircolors on a picture of yourself, with online hairstyles simulation software. With this software you can do makeovers on a picture of yourself and see what you would look like with a new haircut or haircolor. Try out hundreds of new looks before you make your final decision! A small representation of the hair trends in Tokyo. Inspired by hairstyles seen in Shibuya and Harajuku, Tokyo's fashion districts where you can see all the greatest fashion designers. The lovely styles are a combination of classic Asian looks and modern influences and offer something for everyone. Asian hairstyles created by the "A Cut Above" group of hair salons and haidressing academy. 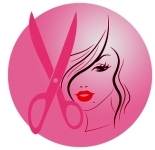 Short haircuts, smooth and with plenty of jazzy cutting lines and clips. The longer hairstyles are smooth or feature beautiful waves and curls. The hair colors have been kept rather light and retro. Essential Looks captures trends and moods and transforms catwalk fashion into wearable hairstyles. The Asian inspired styles pick up the typical classical Asian cuts and mix them with colors and patterns which generate much attention. This hairtrend with bobs is for fashion minded people. Photo gallery with makeovers created in a Japanese hair salon. Interesting photos of Asian total look makeovers (hair, make-up and clothes) for men and women. Short, medium length and long hairstyles for smooth or curly Asian hair. Large photo gallery with Japanese hairstyles. Many different categories: trendy, normal, casual, dressy, conservative, cute, elegant, feminine, Japanese wedding, ... Includes in some cases sideviews and backviews of the hairstyles.